My Area Rug Smells Like Rubber! | Natural Carpet Cleaning & More! My Area Rug Smells Like Rubber! The area rug is brand new. If the rug odor gets worse after vacuuming it, you can bet its deteriorating. We do not suggest immersion washing these hand tufted rugs. Low moisture hand cleaning, or a simple in-house freshen up will be all you need. 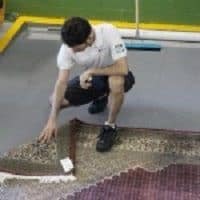 If the odor is causing headaches or just too much to handle, you should consider replacing the rug.